A while back, I wrote the post Modelling Homogenous Landscapes in #ArchiMate (Classes and Instances), which was a first post on modelling detailed infrastructure landscapes. Assuming you’re with me that a modelling language is very useful for large complex situations, but doesn’t add that much value to simple diagrams, we can delve deeper into modelling large infrastructural landscapes in enough detail so that useful analysis is possible. Note: You can use ArchiMate for high-level abstract models and for detailed models, it is your choice. This post is about the detailed and precise use, if that’s not your cup of tea, just read this for entertainment and to think about the effects of choosing your patterns in general. Also, let’s get one thing clear from the start: the fact that I like my detailed administration of the Business-IT landscape to end up in ArchiMate models does not mean I think you need to model the entire enterprise in all its glorious details by hand. In fact, the more we are able to automate discovery and verify it against reality, the more powerful we can be. But getting this data in an ArchiMate model opens the data up for a lot of useful analysis and reporting. That, by the way also doesn’t mean we need to use a big single setup such as some CMDB to model ‘everything’. I strongly believe that the different uses of different structured administration makes it unlikely (if not just a pipe dream) that you can do everything with a single model. And as ArchiMate’s derivation relation shows, creating meaningful derivations (summaries, shortcuts) with a purely syntactical operation is ineffective — which is not unexpected for those who have thought about the differences between grammar (and logic) and meaning. The best setup will have several ‘models’ (structured administrations), but with the added requirement that these are coherent with each other, with each model supporting a different specific set of uses, but all illustrating a different aspect of the same landscape. 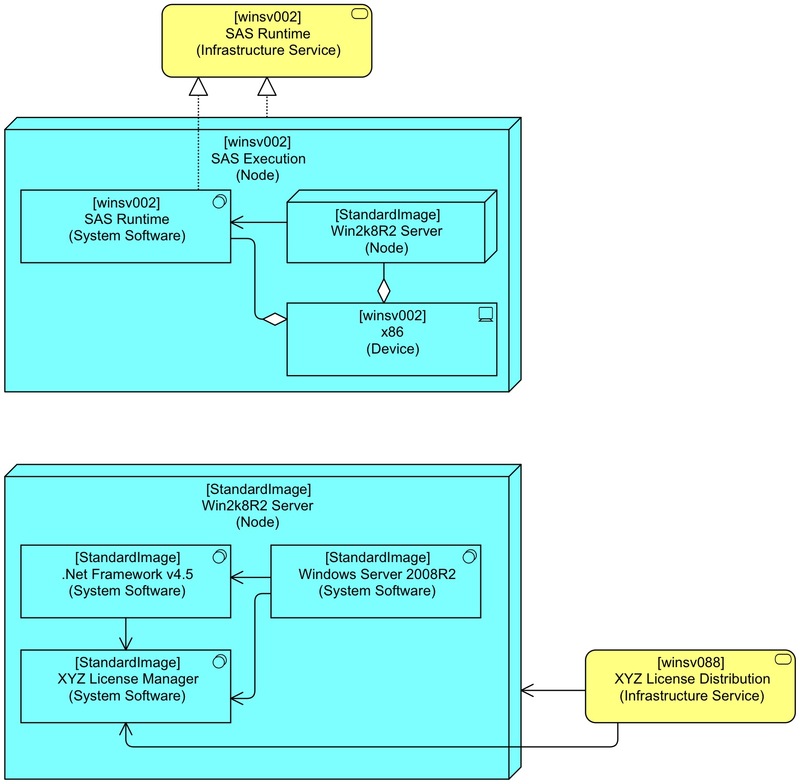 One of the models in such a landscape of models can be a large and detailed ArchiMate model. And the rest of this post is about patterns for building such a model (again: whatever the mode of discovery and verification — it might in part be built directly from a CMDB). Landscapes can be large but homogenous (Spotify, Apple, Microsoft, Google, Amazon, etc. all have large landscapes of identical systems, both infrastructure and applications). Landscapes can also be heterogenous. In this post, I am looking at how to model homogenous landscapes, which means that there is a lot of repetitive information in the model, and we want to prevent somehow that we need to model the same pattern over and over again. We’ve made things a little interesting by having one virtual server and one physical. Still, we see that there is a lot of repetition (which will be even more so if you have hundreds or even thousands of — possibly virtual — servers). 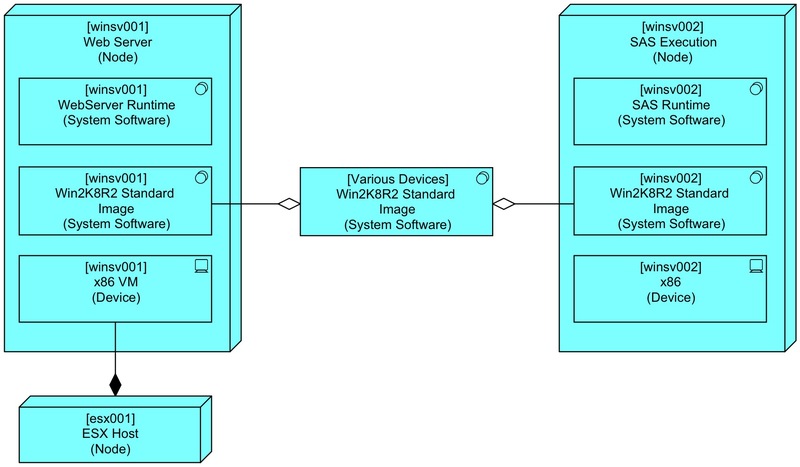 All of our Windows servers have Windows 2008R2 (yes, this is an older example), an XYZ License Manager agent and the .Net Framework 4.5 are part of the standard distribution. The XYZ Licence Manager connects to some central service. And all our Windows servers use a central logging file share in case we do classic file based logging. Which incidentally shows we already had that multiple-composite-parents problem with the virtual Device (mentioned in the book. I think this UML-derived limitation for the Composition relation is useful in IT, but less so in EA, but I digress). Here, we use the re-usable element as a collection of all the instances we have. A really good ArchiMate modelling tool would probably support this via ‘templates’, filling in the correct label information based on the template and variables. (But now I’m dreaming.) This is not my final solution to the problem of Re-Usable modelling for infrastructure, though. At this stage it is wise to revisit the post about analysis of ArchiMate models. How many ways have we now seen that relate an application to underlying Infrastructure Services used? 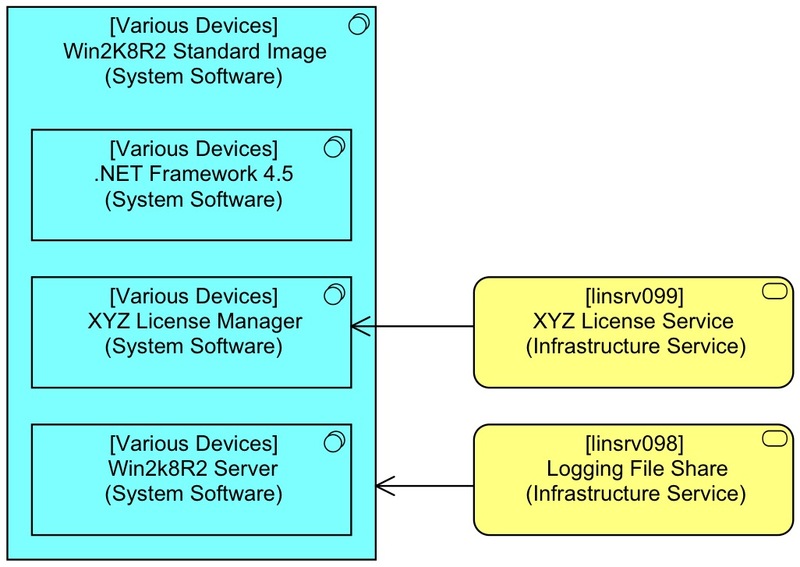 How many different routes are there between the application and used Infrastructure Services such as the [linsrv99] XYZ License Service (Infrastructure Service) and the [linsrv098] Logging File Share (Infrastructure Service)? We Assign all System Software to the Device. Actually it would make more sense to Assign software installed on the OS to the OS, but ArchiMate does not allow Assignments from System Software to System Software (yet?). Besides, we would get a many-level structure which is hard to use for automated analysis. We use (actually derived) Used-By to model internal dependencies. E.g. 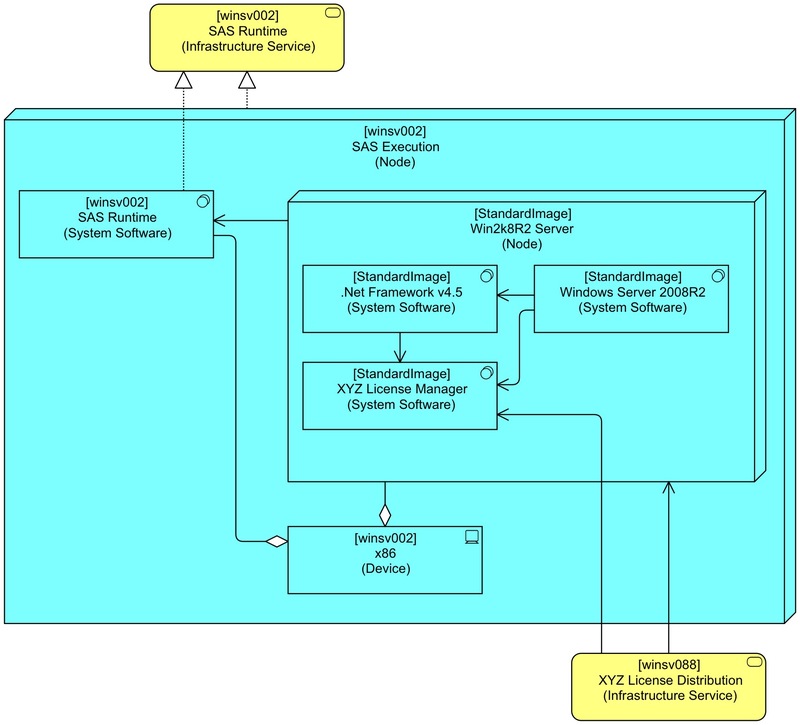 our XYZ License Manager may depend on the .Net Framework 4.5 but the SAS Runtime does not. Without the relations to/from the encapsulating Node, I would always need to add internals to show the relation in a view. That clutters views up and makes communication more difficult than it already is. 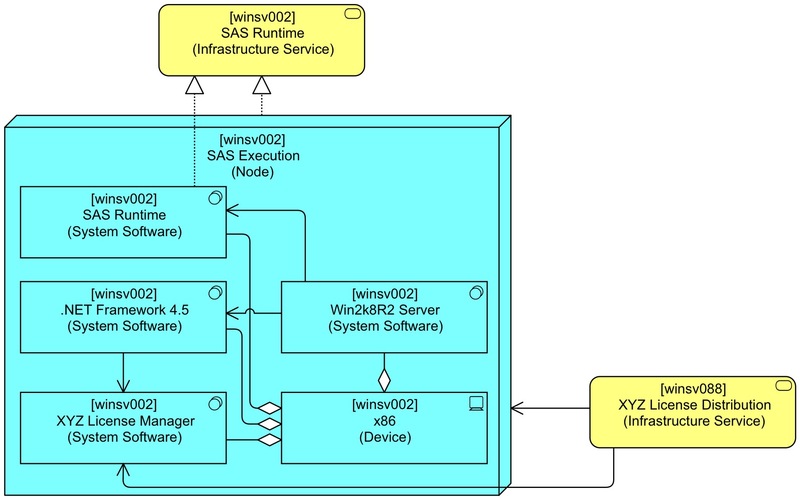 It uses Aggregation instead of Assignment for relating System Software with the Device. This repairs the use of a leftover from ArchiMate 1: the Assignment between Device and System Software. In ArchiMate 1, System Software was a behavioural element, and it was the behaviour of the active Device element. In ArchiMate 2, Infrastructure Function was added and System Software was rebranded as an active element. But the Assignment between Device and System Software was kept, partly I suspect for backward compatibility. In the Mastering ArchiMate book I discuss the role of this Assignment relation in detail in Section 27.3 Fuzzy Concepts. But Assignment between System Software and System Software was not added to ArchiMate 2 (which is an omission, I think). I do not use Composition, because I want to be able to reuse parts of a configuration, as explained below). Using Aggregation for deploying software on software enables us to actually deploy .Net, SAS or the License Manager on the Windows System Software, but I don’t do that because of the extra layering complexity that brings. It models both the relations to the internal elements and the relations to the encapsulating Node. We lose the ‘pure’ encapsulation approach. Note: this is only practical in the infrastructure layer of ArchiMate, because it has that abstract Node element that is generally used for encapsulation. Such an abstract element is unavailable in the other layers. In the application and business layer, we would have, for instance, Application Component encapsulating Application Component, in which case we could not differentiate anymore between relations with outside and inside elements in our analyses. In this case, we always know that if we connect to Node, we are connecting to the encapsulating element. If we connect to System Software, we are connecting to internal details, the encapsulated elements. Second quiz question: there are a few problems lurking here with a common cause. Which ones? If this quiz question has been answered, I’ll present my real solution. If ArchiMate 3 will allow Assignment from System Software to System Software (meaning: deploying one System Software element on another), I will change the internal Aggregation relations back to Assignment and I will change the Node as a ‘reusable element’ back to System Software because of the following disadvantages of the current solution: Reusable system software is now modelled as a Node. It would be more appropriate if it was modelled as … System Software. We cannot do that now because the internal structure of a reusable element would then differ from the internal structure of a standard element, thus adding to the complexity of the number of patterns to take into account. We want a single pattern for Nodes wth or without reuse, and that means we need to use Node and it means we cannot use Assignment. The question how deep you want your reuse levels is up to you. The deeper, the more difficult automatic analysis and reporting. The less deep, the more duplicate parts of patterns you will see. PS. I’ll be speaking at Gartner’s EA Summit 2015 London UK on May 2oth and at the MBT Congres in Houten NL on May 21 about Chess and the Art of Enterprise Architecture. Modelling your current state in Enterprise Architecture for me is like knowing your position before making a move in chess. Rather useful. And ArchiMate is a decent language to do this modelling in. Gerben, as always a great article. Very useful for me as infrastructural architect. The answer to the first question is that the direction of the Composition relation between the XYZ License Manager and the encapsulating Node is reverse to the direction of the Used By relation between XYZ License Manager and the XYZ License Distribution. The direction of a Composition relation is from parent to child thus in this case from encapsulating Node to XYZ License Manager. The direction from the Used By relation is from XYZ License Distribution to XYZ License Manager. This doesn’t make a valid derived relation. For the Realization derived relation the direction is the same, so that results in a valid derived relation. Jean-Baptiste is right. Both red relations are valid derivations of the orange relation and the Composition between Node and encapsulated System Software elements. I was not stating that the orange Used-By was derived. I stated that the red relations were derivations. 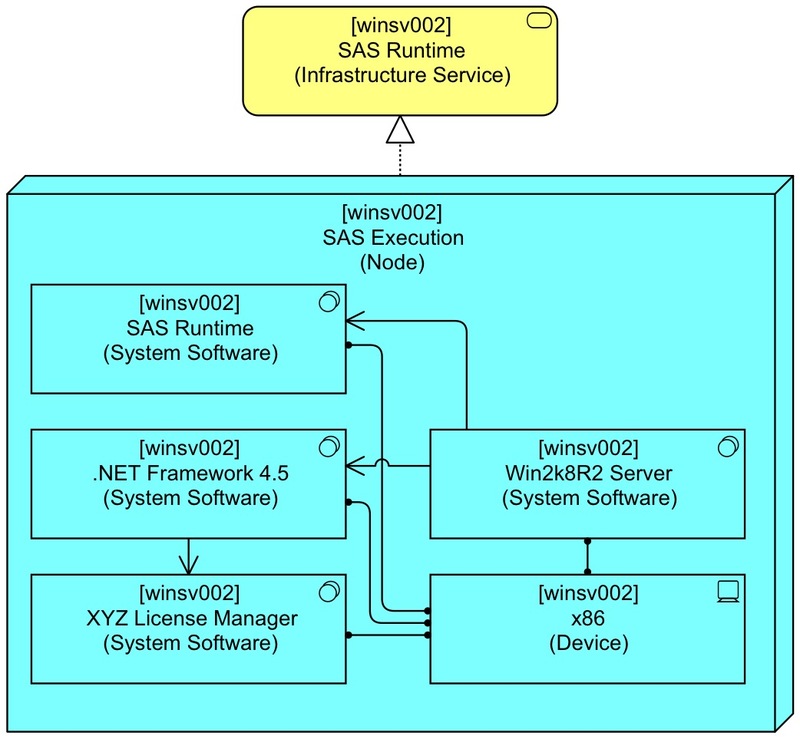 The problem with the Used-By from [winsv088] XYZ License Distribution (Infrastructure Service) to [winsv002] SAS Runtime (Node)is a different one. Now I see that I interpreted the question the other way around. I was indeed saying that the orange Used-by isn’t a valid derived relation from the red Used-by. Of course the red Used-by is a valid derivation of the orange Used-by. But I find it rather counter intuitive to say that the relation between the XYZ License Manager and the XYZ License Distribution is a derived Used-by relation from the Used-by relation between container Node to the XYZ License Distribution. Intuitively the relation is a direct Used-by relation between the two XYZ License elements. 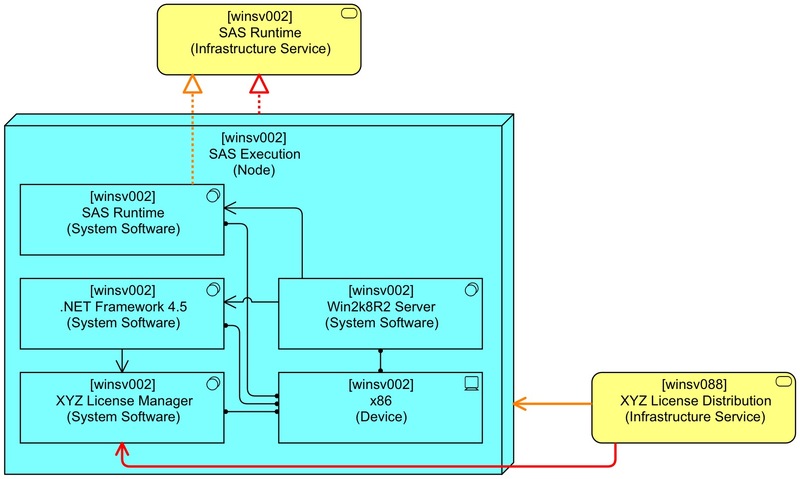 This raises another point (maybe Gerben is pointing at this with his quiz question): If the red Used-by relation between the XYZ License Manager and the XYZ License Distribution is a valid one, than there is also a valid derived used-By relation between the Win2k8R2 Server and the XYZ License Distribution. This is strange because the Win2k8R2 Server isn’t using the XYZ License Distribution. Same goes for the other SystemSoftware elements (SAS Runtime and .NET Framework 4.5). Bingo! That was the answer on the first question that I was looking for. Now, the first one who answers the second question wins the prize (as he/she can also copy this correct answer to the first question). 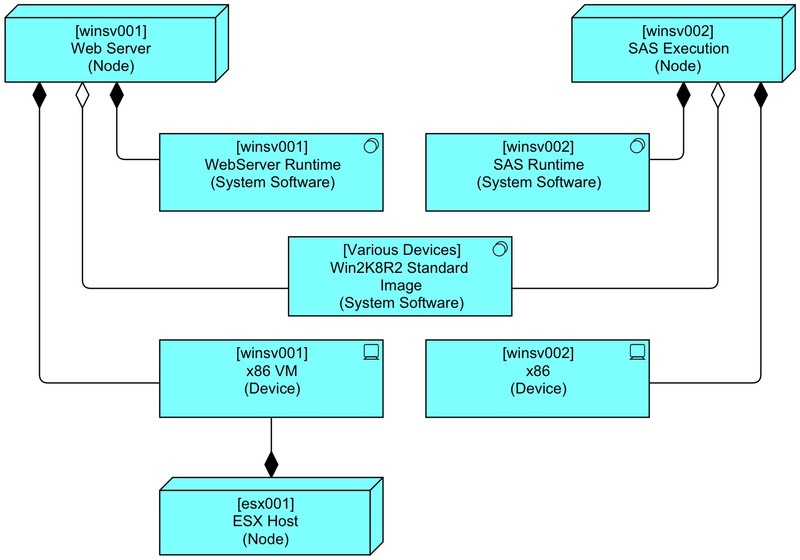 One flaw I see is that as soon as another node use “[StandardImage] Win2k8R2 Server (Node)” using an aggregation from a device, you’ll end up with derived UsedBy relations between those other devices and “[winsv002] SAS Runtime (System Software)” which will mess any potential automatic analysis. Agree. Messes automatic analysis up. It goes even further. If you e.g. 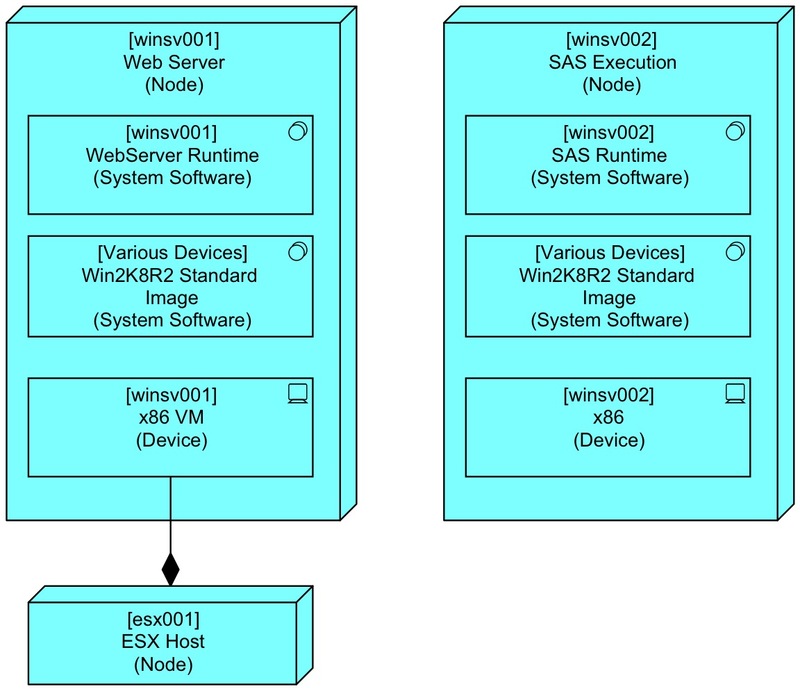 have another instance of the SAS Execution (node) realizing another SAS Runtime (infrastructure service) then the SAS Runtime 1 (infrastructure service) is realized by the SAS Execution 1 (node) and uses the SAS Execution 2(node). Strange. The modelling of reusable building blocks is something I have been struggling with for a longer period. The StandardImage is a reusable pattern, but when there are multiple nodes that reuse that pattern, they have unique instances of this pattern. By using associations the multiple parent issue is solved, but it still are unique instances. E.g. multiple SAS Execution Nodes each have their own XYZ License Manager. Sometimes in an analysis you might be interested in relations with the logical building block (which nodes use this building block?) but sometimes you might be interested in the relations with the instance of the building block. Gerben, please clarify the use of assignment and agregation/composition between software and device. I particulary use composition to describe the relationship between duas elements such as a device and a software, for instance, lets say, between a PC and a Operating System (OS), where the PC (device) is composed of an OS. Why I would use composition instead of agregation? Well, if the father dies (PC) the children (OS) will die along (as rule of thumb); whereas, if you describe it as agregation, the OS would still be alive if the PC died – false statement, would’nt you agree? And I would never use assignment, since it would be a good practice to only use it between ative and behavior elements. Thank you! Hi Luis, I agree with your analysis. I was using Aggregation because when you use a reusable element directly it would become the Composite child of many Devices and that is forbidden in ArchiMate. But in my final solution (next post), I do not directly use the reusable element in each server, so I might indeed use Composition instead of Aggregation. Probably better too.